In the heat of the presidential primary season, University of California, Santa Barbara College Republicans and UCSB for Bernie have stood calmly in their respective corners of the debate ring — until now. In an Oxford Union-style debate on Tues., Feb. 16, two representatives from both campus political organizations donned their proverbial gloves and engaged in their own rhetorical battle for over 50 audience members in the first round of a series of debates expected to be held throughout the primary season. 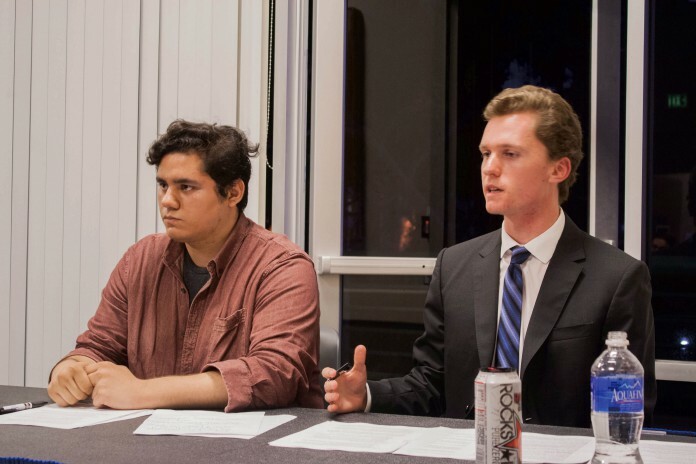 The debate topics for this round were chosen by UCSB College Republicans and focused on two core platform points of the Bernie Sanders’ Campaign: the proposed federal $15 minimum wage and free (federally-funded) tuition for all public universities. These heavy topics, with a world of real-life implications for a crowd of hungry, debt-ridden college students, were lightened, thankfully, with a little levity. “If you’re feeling the burn, try feeling this Bern instead,” third-year religious studies major Eric Villalobos said, as he kicked off the first round and presented his competitors with UCSB for Bernie’s very own custom-made condoms. The speakers then settled into the business at hand, diving into their allotted seven-minute speech. For the first topic, the proposed federal $15 minimum wage, both sides laid out a baseline set of facts. The federal minimum wage, when established in 1933 by the National Industry Recovery Act, established a base level wage of 25 cents an hour. When adjusted for inflation, the equivalent minimum wage in 2016 would be only $4.56, significantly less than the current federal minimum wage of $7.20. It was here where the arguments deviated. 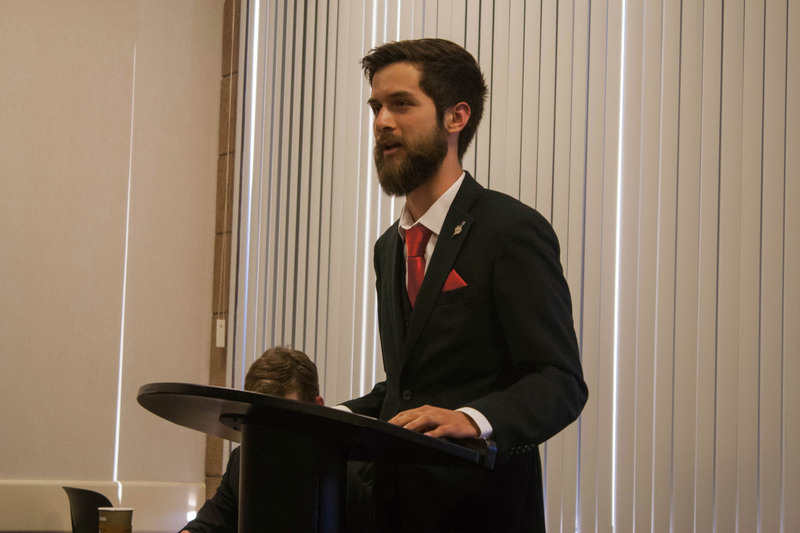 Amid the arguments in favor of allowing states to establish minimum wages and protecting small businesses posed by second-year UCSB College Republicans member Andrew Gates, fellow speaker Ron Papile called for a return to pragmatism. UCSB for Bernie Co-Presidents Eric Villalobos and Guy Singer disagreed, arguing in favor of the proposed federal $15 minimum wage with an argument intended to hit home with many anti-tax conservatives. As topics switched, tensions rose, and the debate became more personal. UCSB College Republicans asked those present to shift their perspective, asserting that there are many jobs on the market that are overlooked because they require a tech degree — and are cheaper to obtain and perhaps pay even more than jobs landed by college grads. Papile also discussed the growing probability of a class of super seniors. Singer argued that complete federal subsidies would do no such thing, as the existence of unit and quarter caps would still remain. College degrees would, most importantly to the Bernie side, keep students competitive in an increasingly cutthroat job market. The thirty minute question and answer session that followed the debate was heated but expectedly so. Most attendees in the crowd did little to appear neutral while wearing their Bernie pins and Reagan-Bush ‘84 t-shirts. It was second-year political science major Natalie Jordan whose question for the Bernie speakers shook an otherwise unwavering crowd. Singer claimed that Bernie’s plan would provide for the building of more and better public institutions where necessary. When asked if her mind had been at all changed, Jordan’s response was light but frank. The crowd swelling out the door shouted back in agreement.